Take a fun and challenging yoga class in one of the greatest settings in the world! Experience the peaceful, healing effects of Lake Tahoe as you take your yoga practice to a whole new level! Classes are taught by long time local and certified stand up paddleboard (SUP) instructor and yoga teacher, Eileen Allen. 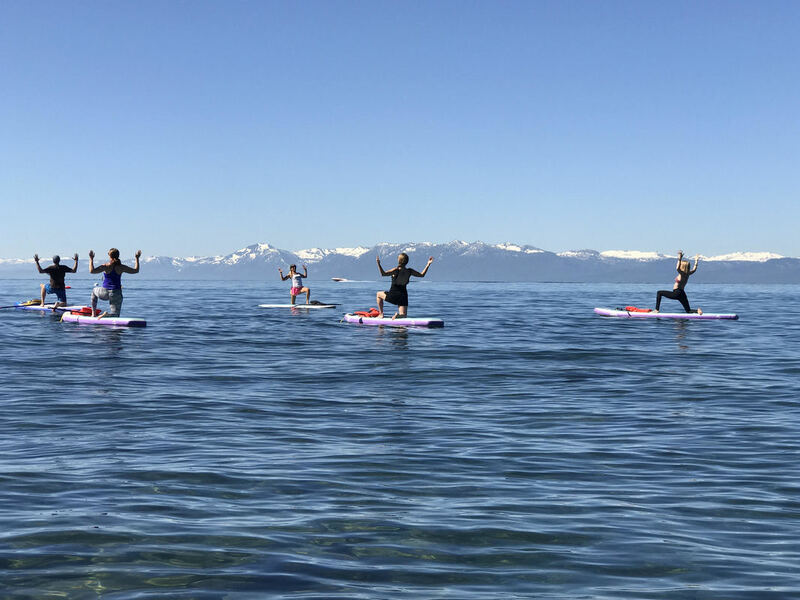 A dedicated SUP yoga teacher, Eileen is enthusiastic about sharing her knowledge and years of experience, ensuring a safe and enjoyable SUP Yoga experience on the beautiful, crystalline waters of Lake Tahoe. Eileen gives expert advice on correct paddle techniques, helping you to feel comfortable and confident on your paddleboard. ​She then guides you through a series of fun, challenging yoga postures on the paddleboard. You will find yourself deeply focused and engaged as you cultivate balance, poise and strength while on the lake, surrounded by magnificent mountain views. Whether you are new to paddle boarding or yoga, or you are a seasoned pro, this is truly an unforgettable experience! 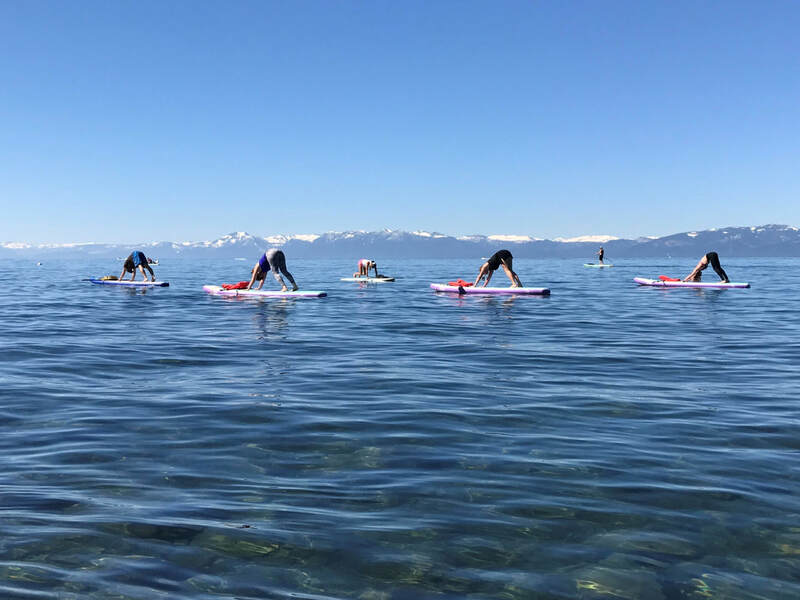 For any inquiries about our SUP yoga classes, please email info@wellbeingtahoe.com. Contact us to arrange a private class for individuals or groups. ​​Board rental is limited, advanced sign-up is required. ​Please sign up by 9pm the night before, at least 12 hours before class. You can sign up online, in store, by calling 530-546-3335, or by email click here. Wear loose, comfortable yoga clothes and/or swimwear. Long sleeves may be required if it's chilly or windy. Flip-flops are recommended for walking from Well Being to the lake. It's very important to apply sunscreen as you'll be in direct sunlight. (Quality, all natural sunscreen is available to purchase at Well Being). Please arrive at Well Being at least 10 minutes before the scheduled start time in order to sign-in and collect your board. ​We will be leaving promptly at the start time, please don't be late! A SUP Yoga session costs $55, including board rental. If you have your own board, pay just $40. Please be aware that we may need to cancel a class on short notice due to weather conditions. Anyone over the age of 18 is welcome to join. Children 12-17 years old must be accompanied by an adult and must be competent swimmers. It is not recommended to take personal items with you. Please either leave items in your car or at Well Being and collect them after the class. Please contact us if you have any questions or if you need help signing up.